In the newly reported data, investigators led by the study's principal investigator, Deepak L. Bhatt, MD, MPH, Professor of Medicine at Harvard Medical School, Executive Director of Interventional Cardiovascular Programs in the Heart and Vascular Center at Brigham and Women's Hospital, and the Principal Investigator and Steering Committee Chair for REDUCE-IT, evaluated patients' total cardiovascular events during the median study follow up of 4.9 years in REDUCE-IT. These analyses were tertiary or exploratory endpoints in REDUCE-IT. Total events included both a patient's first occurrence of MACE as well as all subsequent occurrences of MACE. Recurrent cardiovascular events are common in people who have already had a heart attack. Various studies have found a recurrence rate of close to 50% for any cardiovascular event or for subsequent coronary revascularization in the year after a heart attack, and up to 75% of patients have a recurrent event within 3 years. 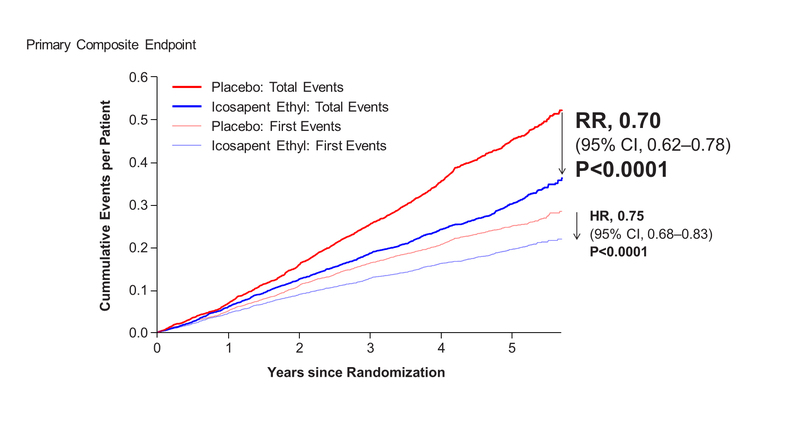 (2) Vascepa reduced total events, first and subsequent events, by 30% compared to placebo, reflecting that for every 1000 patients treated for 5 years with icosapent ethyl versus placebo approximately 159 MACE could be prevented with Vascepa, including prevention of approximately 12 cardiovascular deaths, 42 heart attacks (myocardial infarctions), 14 strokes, 76 coronary revascularizations and 16 episodes of hospitalization for unstable angina. 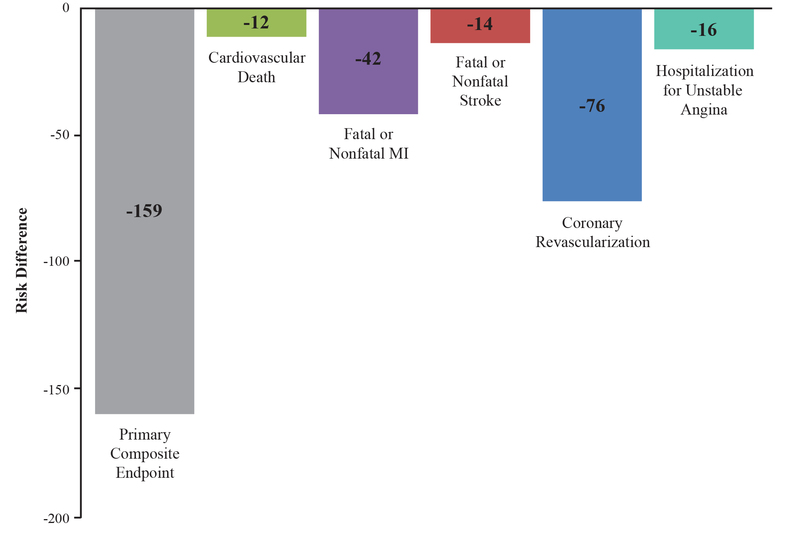 There was also a 28% reduction of total events in the key secondary endpoint of 3-point MACE in the intent-to-treat population consisting of a composite of cardiovascular death, nonfatal heart attack and nonfatal stroke. "This is an impressive degree of risk reduction," said Dr. Bhatt. "From a patient's perspective -- and from my perspective as a physician -- we care about repeat events and the risk of surviving a first stroke or heart attack only to go on to have a subsequent, and potentially fatal, event. The degree of benefit that this analysis reveals is quite large, especially considering that this is an additional layer of benefit on top of what statin and other therapies have already provided." Commenting on this new data, John F. Thero, president and CEO of Amarin said "We believe that the robustly positive cardiovascular outcomes results demonstrated with Vascepa opens the door to a new era in preventative cardiovascular care which can potentially benefit millions of at-risk patients. Just as the REDUCE-IT results demonstrated that the effects of Vascepa are unprecedented in reducing cardiovascular risk in at-risk patients, as separately published, the mechanism of action of the unique small molecule, single active ingredient in Vascepa is multifactorial and differentiated from any other therapy." Dr. Steven Ketchum, president of research and development and chief scientific officer of Amarin stated, "We appreciate the ACC's designation of the new results from REDUCE-IT as late-breaking clinical data as such designation reflects ACC's recognition of the importance of the REDUCE-IT study and these potentially paradigm-changing results. As we witnessed with our two earlier successful Phase 3 studies of Vascepa, the MARINE and ANCHOR studies, we believe clinical results from Vascepa studies are robust and consistently favorable. We look forward to witnessing how these results improve patient care and to further evaluation and publication of data pertaining to Vascepa and REDUCE-IT. We remain very thankful to everyone involved in this landmark study." Amarin plans to webcast live a physician panel discussion for investors and analysts later today (Monday, March 18) at 4:00 p.m. Central Time (CT) / 5:00 p.m. Eastern Time (ET). During the panel discussion leading physicians are anticipated to review data pertaining to Vascepa presented at ACC's 68(th) Annual Scientific Session, including the scheduled presentation today in the late-breaker session regarding additional data from the REDUCE-IT cardiovascular outcomes study. The panel discussion may also cover data from the above described poster and from other posters presented at ACC. This physician panel discussion will commence at the time shown above and will be accessible via webcast through the investor relations section of the company's website at www.amarincorp.com. The panel discussion can also be heard via telephone by dialing 877-407-8033. A replay of the panel discussion will be made available for a period of two weeks following the webcast. To hear a replay of the call, dial 877-481-4010 (inside the United States) or 919-882-2331 (outside the United States). A replay of the panel discussion will also be available through the company's website shortly after the webcast. For both dial-in numbers please use conference ID 44518. (e.g., anaphylactic reaction) to Vascepa or any of its components. was no reported adverse reaction >3% and greater than placebo. break open, crush, dissolve, or chew Vascepa. leading to withdrawal of study drug. treatment group than in the statin plus placebo treatment group. gastrointestinal bleeding events between treatments. and current FDA-approved labeling of such products. Vascepa has been approved for use by the United States Food and Drug Administration (FDA) as an adjunct to diet to reduce triglyceride levels in adult patients with severe (>=500 mg/dL) hypertriglyceridemia. FDA has not reviewed and opined on a supplemental new drug application related to REDUCE-IT. FDA has not reviewed the information herein or determined whether to approve Vascepa for use to reduce the risk of MACE. Nothing in this press release should be construed as promoting the use of Vascepa in any indication that has not been approved by the FDA. This press release contains forward-looking statements, including expectations that REDUCE-IT results could lead to a new treatment paradigm in the patient population studied, help millions of patients, favorably affect the cost of treatment for cardiovascular disease and related productivity. These forward-looking statements are not promises or guarantees and involve substantial risks and uncertainties. In addition, Amarin's ability to effectively commercialize Vascepa will depend in part on its ability to continue to effectively finance its business, efforts of third parties, its ability to gain regulatory approvals, create market demand for Vascepa through education, marketing and sales activities, to achieve market acceptance of Vascepa, to receive adequate levels of reimbursement from third-party payers, to develop and maintain a consistent source of commercial supply at a competitive price, to comply with legal and regulatory requirements in connection with the sale and promotion of Vascepa and to maintain patent protection for Vascepa. Among the factors that could cause actual results to differ materially from those described or projected herein include the following: uncertainties associated generally with research and development, clinical trials and related regulatory approvals; the risk that sales may not meet expectations and related cost may increase beyond expectations; the risk that patents may not be upheld in patent litigation and applications may not result in issued patents sufficient to protect the Vascepa franchise. A further list and description of these risks, uncertainties and other risks associated with an investment in Amarin can be found in Amarin's filings with the U.S. Securities and Exchange Commission, including its most recent annual report on Form 10-K. Existing and prospective investors are cautioned not to place undue reliance on these forward-looking statements, which speak only as of the date hereof. Amarin undertakes no obligation to update or revise the information contained in this press release, whether as a result of new information, future events or circumstances or otherwise. (1) Bhatt DL, Steg PG, Miller M, et al. 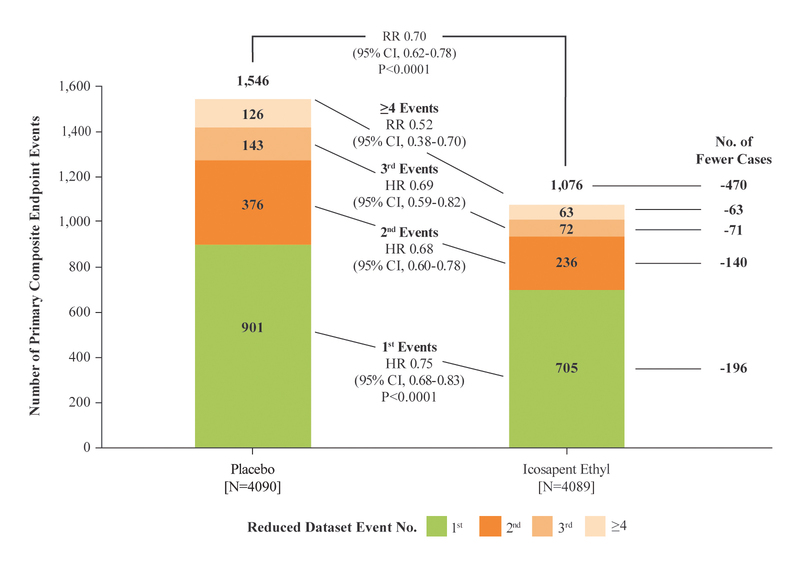 Effects of Icosapent Ethyl on Total Ischemic Events - Further Insights from REDUCE-IT. J Am Coll Cardiol 2019. epub ahead of print. (2 )Bansilal S, Castellano JM, Fuster V. Global burden of CVD: focus on secondary prevention of cardiovascular disease. Int J Cardiol 2015;201:S1-S7. (3) Bhatt DL, Steg PG, Miller M, et al. Cardiovascular Risk Reduction with Icosapent Ethyl for Hypertriglyceridemia. N Engl J Med 2019;380:11-22. (4 )American Heart Association. 2018. Disease and Stroke Statistics-2018 Update. (5) American Heart Association. 2017. Cardiovascular disease: A costly burden for America projections through 2035. (6) Ganda OP, Bhatt DL, Mason RP, et al. Unmet need for adjunctive dyslipidemia therapy in hypertriglyceridemia management. J Am Coll Cardiol. 2018;72(3):330-343. (7) Budoff M. Triglycerides and triglyceride-rich lipoproteins in the causal pathway of cardiovascular disease. Am J Cardiol. 2016;118:138-145. (8) Toth PP, Granowitz C, Hull M, et al. High triglycerides are associated with increased cardiovascular events, medical costs, and resource use: A real-world administrative claims analysis of statin-treated patients with high residual cardiovascular risk. J Am Heart Assoc. 2018;7(15):e008740. (9) Nordestgaard BG. Triglyceride-rich lipoproteins and atherosclerotic cardiovascular disease - New insights from epidemiology, genetics, and biology. Circ Res. 2016;118:547-563. (10) Nordestgaard BG, Varbo A. Triglycerides and cardiovascular disease. Lancet. 2014;384:626-635.